﻿April Fools Day: Calendar, History, Tweets, Facts, Quotes & Activities. April Fools' Day is a light-hearted comedic day of cheer, practical jokes and hoaxes. 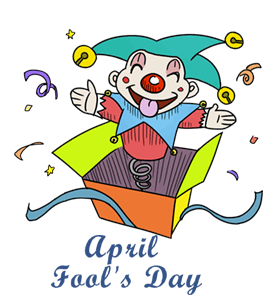 April Fools' Day has been observed for centuries although its origins remain unclear. It has been suggested that in ancient Roman and Hindu cultures, the day originally marked ‘New Year’s Day’. Although in 1582, Pope Gregory XIII issued the Gregorian calendar which moved New Year’s Day from April 1st to January 1st. It is believed that those who continued to celebrate New Year’s Day on April 1st were referred to as fools, leading to the concept of April 1st representing All Fools’ Day. It has also been suggested that April Fools' Day is related to the vernal equinox, the beginning of spring, when Mother Nature plays sudden weather tricks on people. The custom of April Fools' was brought from Britain to the US centuries ago. Both kids and adults in North America and many European countries including the United Kingdom, Ireland, Poland, Finland, Iceland, and North American countries have developed traditional customs to celebrate the day. These typically include fooling another person and yelling April fools. In 2018, Amazon's prank was a video ad showing a new service that allowed customers to have an author delivered to their door. The video featured author Patricia Cornwell rushing to a customers home. Traditionally, pranksters shout April Fool as they reveal the joke. In the United Kingdom, jokes can only be played until midday. If someone plays a joke after midday, then they are the April Fool. In Ireland, tradition was to deliver an important letter to a person, who would then deliver the letter to another person, and so on. Once finally opened, the letter would say send the fool further. For April Fool's Day 2018, Lexus uploaded a video to YouTube about customizing cars according to the person's genes. The video claimed they partnered with 23andMe, a personal genomics and biotechnology company. After collecting a saliva sample, Lexus would tailor the vehicle to the person's needs and tastes using 23andMe's proprietary technology. Examples of features were protective UV tinting for those prone to freckling and windshields to match your eye prescription. On April 1st 2015, the United States Army printed an article about army drones that would deliver 3D-printed pizzas to U.S. army soldiers across the world. The pizzas would be made to order and have a shelf life of three years. Researchers at the U.S. Army Natick Soldier Systems Center were credited with the project and concept. The first drone pizza delivery was cited to be made by April Fools Day 2016. On March 31, 2015, Honda introduced the HR-V Selfie Edition (Honda HR-V SLF). The car featured 10 interior and exterior cameras to allow the driver to snap selfies, while the car is parked. Of course, this was an April Fool's Day joke. On April 1, 2015, singer and actor Katy Perry Instagrammed a photo of herself with her hair chopped off. The photo was captioned with I asked for the Kris Jenner . Perry is known for her ever-changing image transformations, leaving the internet speculating on whether this was actually a prank or if Perry had in fact cut her hair. In the days that followed, Perry’s photos revealed that this was only a prank. Stay on guard! You will surely be the victim of a prank during April Fools' Day, so be extra-careful of pranksters looming around you. With social media, you can use Facebook, Twitter and Instagram to dupe your friends and family. Celebrities too have been fooled on April Fools Day as fake news about marriage, death or other significant events is propelled on social media by fans. 1) Breaking news - create a fictional breaking news item about politics, celebrities, events in your city, etc. 2) You're late for work - tell your friend that the time is 11AM and they aren't at work or school yet. Watch a critically acclaimed Joker batman film: Batman (1989) with Jack Nicholson as the Joker; The Dark Knight (2008) with Heath Ledger as the Joker.